Subscribely WordPress Theme from InkThemes is premium membership theme which is compatible for multipurpose need. Subscribely Theme is best choice for those bloggers or professionals who wants to share their personal training or informative videos and articles in return of some cash. To make this earning concept easier, InkThemes has released this theme which allows you to create membership area so visitors must have to buy membership to watch premium contents on your site, only free contents are accessible without registration. You can create your video website and decide which all videos or any other content you want to protect. Whenever any user visits the protected video or content, it will be displayed as blocked. As soon as the user signup for membership and make payment via PayPal, he will be able to access the content. Subscribely WordPress theme is well implemented with Ink membership plugin that protect your content and premium files. This theme allows you to create multiple membership levels and once visitors subscribe to membership they will be able to access the files. And they can make payment via PayPal. Subscribely WordPress theme has features such as responsive design, various color style. 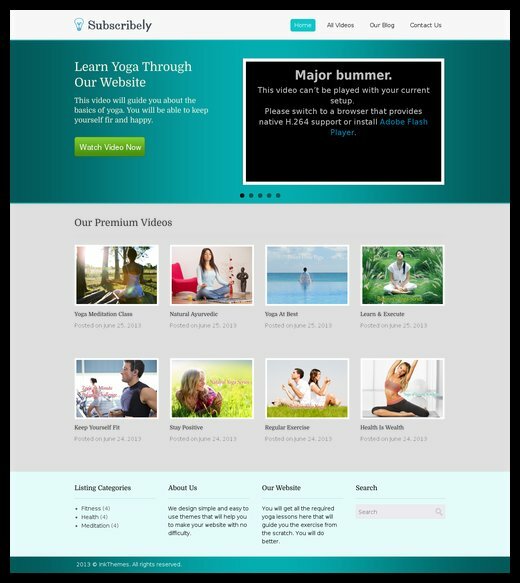 The homepage with video slider, custom menu, featured blocks, 4 column footer area, social sharing icons. The custom page template, advance theme option panel and all standard features integrate. Subscribely WordPress Theme can be used by health instructor, music, education and other business niche where user can register and pay by PayPal in order to watch all protected contents. With this theme you can upload any contents or videos and protect them using in-built feature. The theme functions with Ink Membership plugin which will enable you to protect desired contents for registered members. This special plugin has options to choose currency type, set PayPal email to collect money, add products, bulling type, select price and more. Homepage design of Subscribely Theme includes wide slider to display videos and services. It has grid style featured video section to supported by 4 columns to show many featured videos. In footer area you can place widgets and social media buttons on it’s four column design. For the brand or business header area provides support to upload logo and show custom menu with best categories on your site. Besides individual video page, you can show popular videos list on sidebar so visitors will have more choice to access other videos as well.